Sure, you’ve read an op-ed in The New York Times. You’ve seen an opinion piece here or there, or heard someone trying to persuade somebody else of something somewhere. But what do you really know about writing a persuasive essay? We all know what it looks and sounds like. We see persuasion all the time, everywhere we look: in papers, advertising, or on the TV. Yet seeing it and doing it are two very different things. Just because you watch a YouTube video of a mechanic taking apart a carburetor doesn’t mean you can do it too. You need the tools, the know-how, and the ability. This article will help you to get all three—so let’s go! 1 Definition / What is a Persuasive Essay? 2.1 First step: Pick a topic. 2.2 Second step: Know your audience. 2.3 Third step: Think about your approach. 2.4 Fourth step: Start writing. 6 What Makes These Essays Good? Definition / What is a Persuasive Essay? A persuasive essay is a cross between an opinion essay and an argumentative essay. In an opinion essay, you basically just tell your opinion on a subject. You may try to do it in a convincing manner, but really the point is just to give your opinion however you choose to do so. In an argumentative essay, you are arguing a side of an issue or subject: you do research, you evaluate sources, and you cite references in your paper. The more data you have to back up your claim or argument, the more solid your essay is. The main purpose of the argumentative essay is to show why one side is more credible than another. A persuasive essay is a hybrid of the two: it contains both opinion and argument. The main purpose of the persuasive essay is simply to win over the reader to your side. You can use a mixture of both feeling and fact. You can appeal to the reader’s imagination, emotions, reason, or shared history. The persuasive essay is about how you use rhetoric—words and word arrangements—to convince someone to get on your bandwagon. First step: Pick a topic. Start a persuasive essay by choosing a topic and picking a side. Say you are defending Socrates at his trial. He is facing the charge of corrupting the youth of Athens. You are his lawyer. What will you say to the jury to get him off the hook? Second step: Know your audience. How will you be able to persuade anyone if you do not know who it is you are intending to persuade. Even if your audience is not completely known, you should at least have some idea of who the general reader is so that you can fashion your statements in a way that appeals or makes sense to him. Third step: Think about your approach. Everybody is different—which means we all approach things in our own ways. How should you approach your audience? Forcefully? Subtly? Humorously? Sarcastically? Aggressively? Slyly? Academically? Don’t be offensive or rude. Most people are immediately put off by rudeness and won’t listen to anything more you have to say—even if you are right. Try to bring your reader over to your side by appealing to the transcendental virtues—the one, the good, the true, the beautiful. Most people respond well to these. Use this appeal to maneuver the reader over to your side as you get deeper into your topic. Focus your paper on the goal—convincing your reader to come to your side. Don’t get so lost or wrapped up in your writing that you forget the purpose. Your job is to be mindful of your reader and direct all your energy towards getting that reader to agree with you. If you start to feel like you are getting bogged down in the details, just imagine how your reader is feeling—probably the same way! If it helps, try addressing your reader directly using the 2nd person perspective when you write. Outlining your essay can be an effective way to bring it all together before you start writing. An outline provides a skeleton of what you aim to do. You can use it like a map so that it is easier to see where you want to go and how you can get there. Sometimes there are several paths to take to reach your objective. If this is the case, consider sketching out two or three outlines and then selecting the one that you think does the job of persuading the best. To make an outline, start off with your thesis statement. What is it you want to persuade? Build your introduction around this statement. Start it off with a hook—a line or two—some fact—or a brief anecdote—that lures the reader in. Then segue into your thesis. Your thesis is where you explain up front exactly what it is you plan to do with your essay. It is a signpost for both your reader and yourself. It should serve as the directional guide for the rest of your paper. Following your introduction, proceed into the body of your paper. In a five paragraph essay, you’ll typically have three body paragraphs (along with one introductory paragraph and one concluding paragraph to bring you up to your total). Each body paragraph is there to provide some support for the main idea. For instance, if you are persuading your reader that the film noir genre is the most effective genre for exploring the questions of morality, you might use one body paragraph to examine a noir film by Hitchcock, another body paragraph to examine a neo-noir by the Coen Brothers, and the third paragraph to examine, say, Fritz Lang’s M.
The conclusion comes last. It reiterates the main idea expressed in the introduction and supported in the body of the paper. It reminds the reader of why he or she should support the viewpoint put forward in the essay. It should also go out with a bang, just as the intro commenced with a hook. a. Movies teach us about ourselves and about morality. b. One of the most effective genres for exploring morality is the noir genre. c. This paper will show you why film noir is so good at getting us to think about morality and moral order by examining three noir films: Hitchcock’s I Confess (1953), the Coen Brothers’ Miller’s Crossing (1990), and Fritz Lang’s M (1931). a. Hitchcock’s I Confess is about a priest wrongfully accused of murder. i. The priest knows who the real murderer is but is bound by the seal of confession and cannot disclose this information to the police. ii. The priest allows himself to be tried in court and accepts the scorn given him by the public in the same manner as Christ. iii. The film teaches a lesson in guilt, duty, honor and forgiveness. b. The Coen Brothers’ Miller’s Crossing is about Irish, Italian and Jewish gangsters competing for power. i. The two Irish gangsters are in love with the sister of the Jewish gangster. ii. She wants them to protect her brother from the Italian gangster. iii. One Irish gangster wants to cut the girl’s brother loose, the other wants to protect him. The two Irish gangsters fall out with one another as a result. iv. The film raises questions about ethics, honesty, honor, and principles. c. Fritz Lang’s M is about a child murderer loose in Germany. i. The murderer is hunted both by the police and the criminal underworld. ii. The murderer is found by the criminal underworld and given a show trial. iii. The murderer is found guilty and is condemned to death—but the police arrive just before he can be killed—and a real trial is held. iv. The lesson is given by a grieving mother whose child was killed; she gives the last line of the film: she suggests that we are all responsible. a. The film noir genre shows that morality can be explored very deeply in a number of ways. b. These films are all different but each one provokes questions of what it means to be a good person and what standards or principles we should measure up to. c. Go watch some film noir tonight and see for yourself! Choosing a persuasive essay topic is easy—all you have to do is think about what you like to talk about. Consider that some people will have little awareness or interest in the same things that you like—so this is your opportunity to persuade them to get interested! Whether you’re into baseball, dancing, architecture, history, science, or law—choose from any of these areas and start sketching out a way to persuade a reader of some point of view that relates to your topic. If you have no interests, no worries! Here is a list of persuasive essay topics to help get your creative juices flowing. Let’s look at a couple persuasive essay examples to help you better understand how this type of paper should look. First, we’ll show you an essay based on the outline provided above. Then we’ll show you an essay based on why a healthy diet is crucial to having a healthy life. Who doesn’t like movies? They entertain us, excite us, and make us wonder. Movies also teach us about ourselves and help us raise questions about morality and the moral order. One of the most effective genres for exploring morality is the noir genre. In fact, film noir is so good at getting us to think about morality and the moral order that a brief examination of three noir films—Hitchcock’s I Confess (1953), the Coen Brothers’ Miller’s Crossing (1990), and Fritz Lang’s M (1931)—will show you just how deeply this genre can take you into the moral realm. Hitchcock’s I Confess is about a priest wrongfully accused of murder. The priest knows who the real murderer is but is bound by the seal of confession and cannot disclose this information to the police. The priest allows himself to be tried in court and accepts the scorn given him by the public in the same manner as Christ. The film teaches a lesson in guilt, duty, honor and forgiveness. It shows that no matter what happens, you have to be true to your principles—even if that means sacrificing your life. What a great moral to learn! Let’s look at another. The Coen Brothers’ Miller’s Crossing is about Irish, Italian and Jewish gangsters competing for power. The two Irish gangsters are in love with the sister of the Jewish gangster. She wants them to protect her brother from the Italian gangster. One Irish gangster wants to cut the girl’s brother loose, the other wants to protect him. The two Irish gangsters fall out with one another as a result. The film raises questions about ethics, honesty, honor, and principles. It doesn’t hit you over the head with answers, but it does allow you to meditate on these ideas long after it’s over. Thoughtfulness is crucial to morality—and this brings us to our third film: Lang’s M.
Fritz Lang’s M is about a child murderer loose in Germany. The murderer is hunted both by the police and the criminal underworld. The murderer is found by the criminal underworld and given a show trial. The murderer is found guilty and is condemned to death—but the police arrive just before he can be killed—and a real trial is held. The lesson is given by a grieving mother whose child was killed; she gives the last line of the film: she suggests that we are all responsible. Name another film that gets us to look so deeply into our souls as this one! In conclusion, the film noir genre shows that morality can be explored very deeply in a number of ways. These films are all different but each one provokes questions of what it means to be a good person and what standards or principles we should measure up to. Go watch some film noir tonight and see for yourself! Example #2: Eat Your Way to a Healthy Life! That Coke and Big Mac might sound tempting—but just think about what you’re putting in your body! Sugar and artificially processed ingredients—yuck! Mother Earth isn’t there to be ignored. She gives us everything we need to live well. The problem is we disregard her and get hooked on sugary sweet snacks and convenience foods. Well, guess what? Not only is healthy, organic, all-natural food better for your mind and body, it also tastes a lot better than the soda-fast food-combo that you get from your local drive-thru! Even more than that, a healthy diet can actually promote sociality and foster a greater communal spirit. When all is said and done, there’s no beating a healthy diet for a healthy life and this paper will show why. Fast food helps to fill an empty spot in the stomach—but that is about all it does. It’s not very nutritious and the sugary beverages and inorganic food items are pumped full of flavorings to give them a taste they don’t actually naturally possess. Natural food, on the other hand, has its own quality tastes—and it’s good for the body too. An organic diet can do more than just fill the empty spot in the stomach—it can help you lose weight, fight diabetes, and be more energized throughout your day. An organic diet also allows you to tap into the type of lifestyle we were made to have: one that is more focused on the tradition of preparing food and enjoying a home-cooked meal. Meals bring people together, whereas fast-food from the drive-thru just allows people to keep running so that they are not required to spend any time together. So there you have it!—an organic diet promotes sociality! Eating a healthy diet can also help you to fight cancer. Think about it. Cancer is your body’s way of reacting to all sorts of bad things that we put into it. If we put good things into it—things that come straight from Mother Earth the way they are supposed to come—our bodies will respond happily. A happy body is a healthy body—so start eating right and reap the rewards! With all that in mind, just remember: fast food may be fast and convenient—but it’s also a good way to end up overweight or, worse yet, in an early grave. Start eating smart and being good to yourself: eat a healthy, organic diet that consists of natural foods. Prepare your own meals. Eat with friends and family—make dinner time a custom again where mirth and friendship is fostered! What Makes These Essays Good? In each example, the essays start off with a compelling title that hints at what the essay will be about. The paper then delivers a great hook that makes the reader want to keep going. Finally, the introduction provides a thesis statement that announces the main topic of the paper and describes how that topic will be explored. Each essay then goes on to persuade the reader by using concrete examples to get the point across. (It is a lot harder to persuade someone of something when you don’t have any facts or evidence to support your claim). Additionally, the essays use reason and logic to persuade the reader as well. Everyone likes to have reasons—and these essays work because they give them to the reader in spades. Our essay writing service can do the same for you! We take your order, follow your instructions, and deliver to you a personalized persuasive essay that is written entirely for your benefit. Our model essays are constructed from scratch every time a client places an order because each essay is a tailor-made example of how a particular topic may be examined in the essay format you require. Our examples have been helping students for years. Whenever it is time to write your paper, let us lead the way by providing you with a model essay based on your very own topic, written according to your very own parameters. Our professional writers are experienced and qualified—and, above all, they enjoy helping students master the art of essay writing. When you can see how someone else would do it, it’s easier for you to then do it on your own! So try us out and place an order today. Writing a persuasive essay is easy as 1, 2, 3! All you have to do is think like a tiger: recognize your prey (that’s your audience) and pounce. How do you do that? You don’t pounce with claws—no! You pounce with words and ideas. That’s the point of a persuasive essay, after all. Instead of dragging your prey back to your cave, you get your reader to follow you willingly. You bring up the topic, introduce your perspective, and use all sorts of appeals—whether logical ones, emotional ones, or historical ones—to persuade your reader. Pick a topic that is right for you. Try to make it something you already feel passionate about. That will make it easier for you to convince your reader to see it the way you do. If you have to persuade someone to do something you yourself would never do, it might be a lot harder. So—if you have a choice—choose a subject that is dear to your own heart. Then show someone else why it should be dear to theirs as well. Sketch an outline of your essay before you begin. Everybody hangs upon a skeleton. Think of your essay in the same way: an outline serves as the frame of your paper. Once you have it situated and aligned, it is smooth sailing from there. You simply need to plug in the appropriate parts—and off you go! Always remember to know your audience. Your audience is key to your writing. Indeed, you’re writing for them, aren’t you? So know who they are—and then you can tailor your words to meet their needs. Think about it: if you’re writing to persuade the dean of your college to lower tuition, would you adopt the same tone of voice in your writing that you would use if you were addressing your friends at the gym? No. Or say you’re writing a persuasive essay addressed to persons of a political party opposite your own. Would you start off by insulting their party and their ideas? Not unless you wanted to turn them off immediately and lose! No, instead, you would try to establish common ground so that your reader would be willing to engage with you and your ideas and perhaps discover without realizing it that your perspective is actually worth adhering to. So these are the things you should try to consider when you begin your persuasive essay. Pick a topic you like—then consider your audience. Your audience will show you what type of approach you should take—whether you should use more emotional appeals than rational, for example (or vice versa). Once you figure out what approach to take, you can start writing. Formulate your main idea into a thesis statement, construct an outline, and follow it to the end. There you have it! 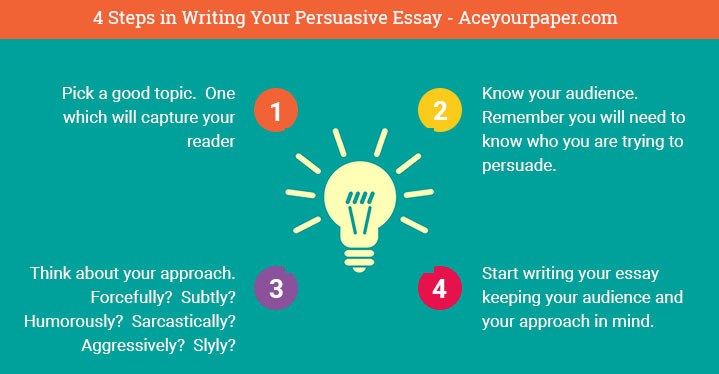 Follow these easy steps and recommendations to a great persuasive essay. "How to Write a Persuasive Essay w/ Examples." Aceyourpaper.com. Student Network Resources Inc, 29 July. 2017. Web. 19 April 2019. Student Network Resources Inc. "How to Write a Persuasive Essay w/ Examples." Aceyourpaper.com. https://www.aceyourpaper.com/essay-writing/persuasive-essay/ (accessed April 19, 2019).